I can't believe we are halfway through winter and I haven't posted a single soup recipe. Soups are a must for me in the winter time because they are the most cozy dinner choice and they have a way of warming the body and soul. The only trouble I find with them is that they have a tricky way of making you feel super full after just one bowl, only an hour later you end up feeling really hungry again. For that reason, I always make a bunch of big sides to go along with it. This time there was a green bean haloumi salad, a portabella spaghetti casserole as well as the cheesy toasts and a chai latte drink. 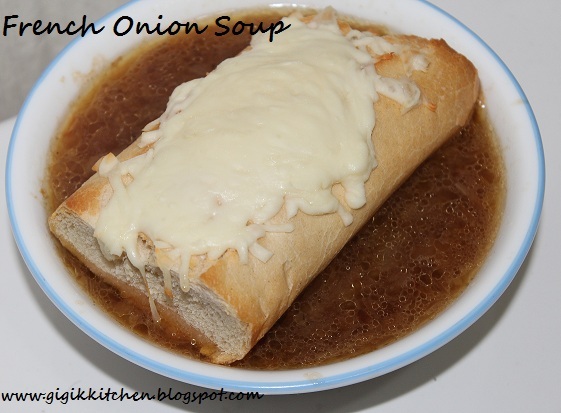 This french onion soup is one of our favorites as it is hearty and intense and the absolute best remedy for a cold and brittle winter day. Who doesn't like a meal in a bowl that leaves the kitchen smelling amazing! We don't often finish off every last bit of soup in the pot, this one was gone almost immediately after it was served so you know I'm not kidding when I say it was delicious! Here's the recipe, perhaps you can bring some of that warmth into your home with this delectable dish. Can be cooked in a slow cooker for a fuss free meal for 3-4 hours. 1. Put the butter in a medium sized soup pot and turn on a medium flame underneath it. Stir the butter constantly as it melts. 2. Chop the vidalia onions up and add them to the butter in the pot. Allow them to saute until they are tender and almost translucent. Add the sugar and cook for another 2-3 minutes so that they can caramelize stirring constantly to avoid burning them. 3. Add the flour, salt and pepper to the onions in the pot and stir to incorporate all of the ingredients. 4. Then add the onion soup mix consomme and the water. Bring it to a boil and then reduce the heat allowing it to boil and simmer for another 10-15 minutes. 5. Sprinkle the Parmesan cheese into the soup a handful at a time, stirring to melt and incorporate. 6. The cheese toasts are simple. Lay the pieces of french bread out onto a greased baking sheet. Spread them with a tiny amount of butter and then sprinkle the tops with a handful of mozzarella. Broil them for about 2-3 minutes ( I like to do so in a toaster oven for 4-5 minutes) 4 inches from the heat or until the cheese has melted and the bread is crisp. 7. Ladle the soup into bowls and top each one with a cheese toast. What is your favorite soup for the winter time or any time? I'd really like to know so leave it in the comments form please- I love to hear from you! Thanks for stopping by! Stay warm! If you haven't already, You can Subscribe with Google Friend Connect, Bloglovin and My RSS Feed (to get notifications by email) which are all located in the left side bar of my blog to keep up with what's going on at Gigi's Kitchen all the time. Don't Forget to Follow me Facebook as well-(here and here), Twitter and Pinterest too!